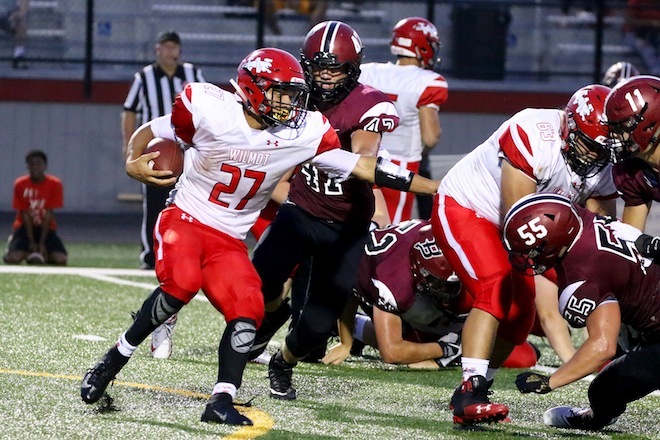 Wilmot’s Austin Norton prepares to plow through a sea of Kenosha Bradford defenders during his team’s Aug. 17 season opener (Earlene Frederick/The Report). Since 2015, when Wilmot Union High School started to open its football season in a clash with Kenosha Bradford, the first three meetings have been decided by one score or less. The Aug. 17 showdown, however, needed four overtimes and more than three hours of football to deliver a winner in the closest margin of all four meetings between the two schools. After regulation, which saw a 10-10 deadlock, both teams missed field goals and scored touchdowns in the first three overtime periods. By the fourth overtime, with Bradford ahead 19-16 following 30-yard Arjan Osmani field goal, the Panthers needed three plays capped off by a 1-yard Austin Norton touchdown run to come away with a 22-19 victory. The close margin, according to Panthers coach Keiya Square, did not come as a surprise. For Norton, who struggled to find the holes in regulation, he credits the Panthers’ stingy defense for keeping them in the contest. Defensively, Wilmot forced four turnovers, including a Joey Tanski interception in the first quarter. “A lot of run plays, they weren’t there, they had a lot of guys blitzing, a lot of holes got blown up, but we managed, obviously our defense was the power of us tonight,” said Norton. The Panthers front seven, which included Kevin Brenner, Jorge Zataran, Max Iverson and Tanner Peterson held Bradford’s leading rusher Joey Bobeck to 27 yards rushing. “Those guys were just relentless against the run and getting off blocks and making it really hard for them to run,” said Square. Along with turnovers, the Red Devils had key plays negated by penalties. The Panthers, who recovered a Will Darden fumble at the Bradford 25 yard line with 5:12 in the first quarter, jumped to a 3-0 lead after Joe Davis kicked a 41-yard field goal three plays later. In the second quarter, after Bradford turned the ball over on downs at the Wilmot 41 yard line, the Panthers produced 41-yard scoring drive. A Norton 26 yard run followed by a Jimmy Weber 19 yard catch from Zach Lamberson put the Panthers at the Bradford 14 yard line. Bradford then committed a personal foul to push the ball to the 7 yard line, where Lamberson rushed in for a touchdown to pull the Panthers ahead 10-0 with 5:28 remaining in the first half. The Red Devils respond nearly four minutes later on a Nate Bowens 1-yard run to cut the Panthers lead to 10-7 entering halftime. With 2:24 left in regulation, the Red Devils produced a 13-play drive, which Osmani ended on a 27-yard field goal to take the contest into overtime. In overtime, where both teams did not score in the first two frames, the Panthers opened the third overtime with a touchdown by an offensive lineman. At the 3-yard line, the ball came loose as Norton pushed into the end zone, where Tallon Cole jumped on the ball to put the Panthers ahead 16-10. Bradford answered, however, when Bobeck aired a 25-yard pass to Tavy Crump, who wrestled with Panthers Caden Mulhollon for possession of the ball as both came tumbling down into the end zone. Both teams missed their two-point conversion attempts. The Red Devils, who opened the fourth overtime, were held to a 30-yard field goal after three consecutive incomplete passes from Bobeck. In the Panthers’ first offensive play of the fourth overtime, Lamberson found Norton on a screen pass on the right sideline, where the running back jetted towards the 1-yard line. When the ball floated in the air, Norton knew he could get towards the end zone. get in that end zone,” said Norton, who eventually scored the game-winning touchdown. For Square, he believed in Norton on the final play of the contest.